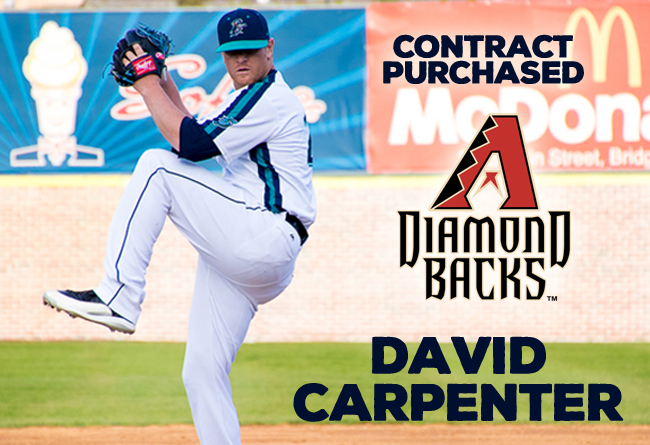 (Bridgeport, Conn., July 20, 2017) – Bridgeport Bluefish team officials have announced that closer David Carpenter has had his contract purchased by the Arizona Diamondbacks organization. He will report to Double-A Jackson of the Southern League. Carpenter has made 37 appearances with the ‘Fish in 2017, posting an impressive 1.91 ERA with 45 strikeouts in 37.2 innings pitched. He is also leading the Atlantic League with 30 saves. In 2016, he made 36 mound appearances before he had his contract purchased by the Los Angeles Angels of Anaheim organization and was assigned to Triple-A Salt Lake of the Pacific Coast League. David is the fifth Bluefish player to have his contract purchased during the 2017 season.